In case you didn't notice it, I didn't review anything by Guided By Voices (GBV) last year. They "only" put out one studio album in 2018 and it was a good one (which I plan to review soon, along with the singles released with it). But no, I held off because I knew the band was planning something bigger. They had more than just teased about a new two LP monster slated for early in 2019 called Zeppelin Over China. Well, that time has come and it was worth the wait. The last two GBV albums I wrote about were in 2017, the fine live document of their legendary Austin City Limits performance (click here for that review) and their sprawling-but-tasty two-LP August By Cake (their 100th album! ), the fine single disc How Do You Spell Heaven and the might-as-well-have-been-a-GBV-album side project called ESP Ohio (click here for that one). So I figured since GBV was taking a pause to catch its breath I would as well and thus held off on reviewing the terrific Space Gun album (and the live Ogres's Trumpet). Those will come soon. 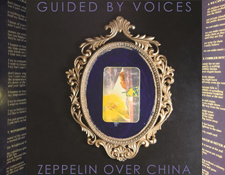 Anyhow, the real good news is that Zeppelin Over China is not only a real good GBV album but it also sounds real good. Yup, that's three "real goods" in one sentence. The current incarnation of GBV may arguably be a best of all worlds scenario in terms of how it works with main songwriter, visionary and singer Robert Pollard. This grouping seems to have achieved a balance between the raw freewheeling grandeur of the original band and the tight precision of the so-called "Cobra Verde" band (which came on board as the band signed to the influential Matador Records label and began its ascent to indie rock superstar legend with records produced by the likes of The Cars' Ric Ocasek. They had a big opportunity and went for the golden ring. And they sort of got it in many ways because they are still here doing their own thing on their own label, running their own business, rocking whatever dang music they want. Zeppelin Over China is cool because it seems that lead singer and main songwriter Robert Pollard finally has a group of musicians who can keep up with him and all his stylistic whims. In the past, Pollard would opt to put some of this type of (dare I say) eclectic material on his many fine solo albums which could have a slightly different vibe than GBV. This version of the band -- which features Bobby Bare Jr. and Doug Gillard on guitar plus drummer Kevin March -- is indeed a powerhouse of amplifier tones, propulsive drumming and pure rock 'n roll essence. Yet, they are also accomplished musicians who are especially good at interpreting Pollard's vision. For those of you who may be gun-shy to GBV records due to the sometimes erratic nature of earlier releases (often mixing up cassette boombox demos alongside polished studio recordings), Zeppelin Over China is a consistent high fidelity studio-made listen. Early "lo fi" indie rock could be off putting to some audiophiles. This album isn't like that. Its a HiFi affair, probably digitally recorded but not in a bad way. It sounds quite good all things considered. Heck, there are even strings on it! Producer Travis Harrison seems to have found that sweet spot for making GBV records, having honed his craft on not only their last few albums (the ones I mentioned above) but also in his work with the likes of Built to Spill and John Brodeur (whose fine Bird Streets album I reviewed recently here). Ain't it neat when the dots get connected? As with every GBV album, melodies and favorites will reach out and glom onto your psyche with each listen. Thus far after just two listens some of the stand out tracks for me are the pumping "The Rally Boys" (with the aforementioned strings 'n stuff) and Side Two closer "You Own The Night" (with its various movements, mellotron touches, time changes, acoustic guitar flourishes and epic end, all in three minutes and twenty-four seconds). "Where Have You Been All My Life" could be a lost Ramones tune -- its that fast and that driving, clocking in at 1:48. "We Can Make Music" is one of those classic Pollard melodies which rope you in with a simple classic refrain ("...into the future...") and some of his more thoughtful lyrics of recent vintage ("We can make music with the trees, shake them so they'll sing, until they are free. We write for them, I really believe...."
The second disc in the set seems to be a bit moodier and eclectic, more akin to one of Robert Pollard's solo albums. In my book, this is a good thing. Mid-tempo churners like "Einstein's Angel" and "The Hearing Department" add depth to the mix, making Zeppelin Over China play more like a classic album by The Who than "just" an indie rock production. The waltz-like "No Point" is a lovely breather with lush strings and acoustic guitar, a welcome break before the massive "Lurk Of The Worm" kicks in with its driving psychedelic stop-start pulse before the electrifying manic conclusion. The LP of Zeppelin Over China is pressed on pretty high quality, standard weight dark black vinyl that is quiet and well centered. 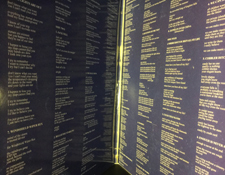 Each disc comes in an audiophile-grade plastic-lined black paper inner sleeve. The download which comes with the album is available in a "lossless" CD quality wav format which actually sounds pretty sweet too. Nice that they offer the consumer an option over simple MP3. 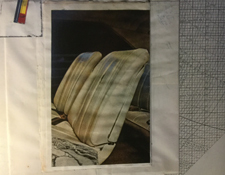 The cover art is also pretty wonderful, again featuring Pollard's collage work and nifty design details such as a worn out album "spine" when you open up the gatefold cover. Zeppelin Over China isn't streaming completely on Tidal yet but you can hear "The Rally Boys" there (click here) and "My Future In Barcelona" (click here). You can also find many of Guided By Voices' albums and EPs up there on Tidal (click here for the artist link) so if you have a subscription to that service its a good way to explore their many records. 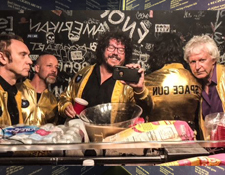 So, yeah, welcome to 2019 and welcome to the new Guided By Voices album, Zeppelin Over China. Other records are planned for 2019 and 2020 so stay tuned here and we'll try to keep you up on the anticipated barrage of releases.